Marcos, 50, hobbled into the pharmacy. “My feet are killing me! Is there anything I can do to stop this pain?” he asked the pharmacist. The pharmacist knows all about foot pain since he has stood in the pharmacy at least 60 hours a week for the last quarter century. 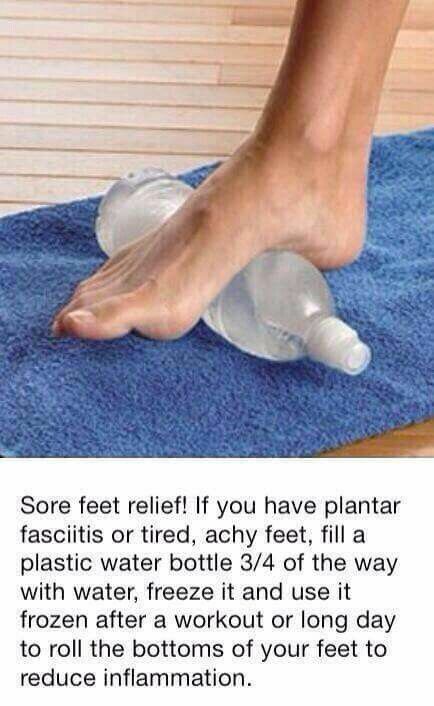 Foot pain is very common. According to a 2013 study, 19% of men and 25% of women have significant foot pain on most days of the week. The chances are that this pain is associated with work and the shoes one wears to work. Not all foot agony is the same. The most common pain in the bottom of the foot is heel pain. Marcos told the pharmacist that this aching tends to be worse first thing in the morning or after rest. The pharmacist told him that it is associated with a tight ligament in the bottom of the foot called the plantar fascia. X-rays will often reveal a spur on the bottom of the heel. However, trouble in the back of the heel can be due to bony enlargements (Hagland's deformity), spurring in the Achilles tendon, or Achilles tendonitis. Burning pain in the bottom of the foot may be caused by a condition called tarsal tunnel syndrome, or it may be due to peripheral neuropathy. People with diabetes frequently experience burning in the bottom of the feet. Pain in the middle of the arch of the foot that is also associated with small, hard knots may be due to plantar fibromatosis, in which overgrowths of skin and subcutaneous connective tissue develop benign tumors called fibromas. P ain in the ball of the foot can be caused by calluses, the result of inflammation of a tendon into the toe, inflammation of the joint, or due to a pinched nerve called a neuroma. Pain of sudden onset without the occurrence of injury on the top of the foot just behind the toes may be a stress fracture of a metatarsal bone. There is frequently swelling in the area and it is painful to the touch. 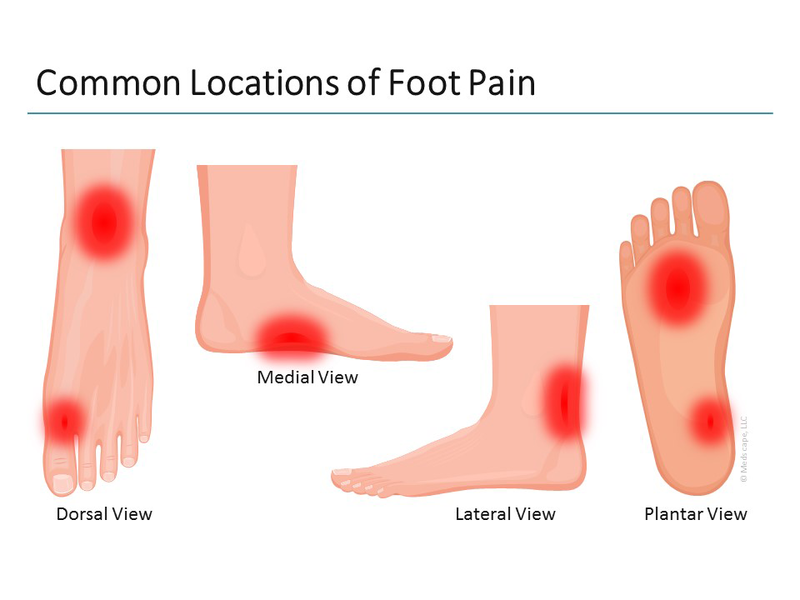 Another common area of pain occurs near the middle of the top of the foot, generally a bit to the outside of the foot. In this area, the tendons that go to the toes can become inflamed. This is called extensor tendonitis. One cause of this condition is excessive tightness of the calf muscle. When the calf muscle is taut, it places excessive stress on the tendons on the top of the foot that pull the foot upward and against the tightness of the calf muscles. Wearing a shoe with a 1-inch heel will help to take the stress off the tendons on the top of the foot. When we evolved from being knuckle-dragging Neanderthals to standing on our own two feet, all of our body weight shifted to our ex-hind legs. So when one’s shoes do not fit correctly, the feet attempt to accommodate one’s weight by changing shape. This can hurt and erode one’s ability to function. 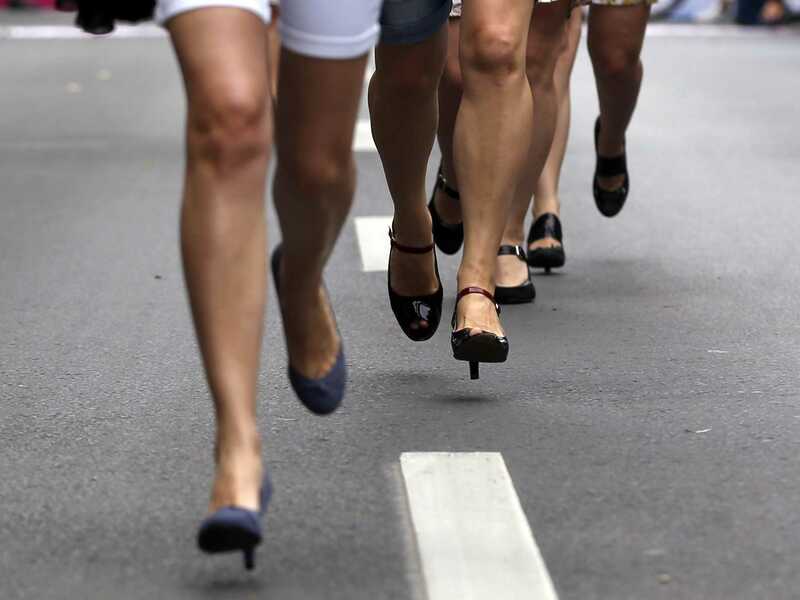 Women’s fashion mandates that the female foot is crammed into a shape nature never intended and wants it to be hoisted on 6-inch heels to boot. Returning the feet to their original shape may quiet foot pain. 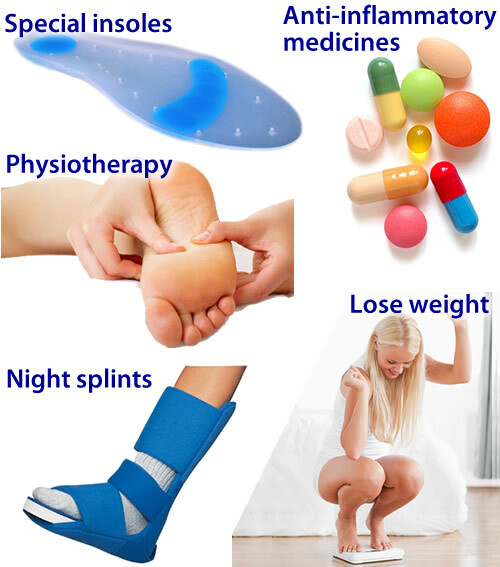 Orthotics deal with the provision and use of artificial devices such as splints and braces. Orthotics can be full length or ¾ length. They can be rigid, semi-rigid, or soft. They help the foot, ankle, and knee by giving arch support, shock absorption, and off-load excess pressure on the foot. Ask your pharmacist about which orthotics to purchase. Marcos agreed that he needs new work boots. He has consulted the pharmacist about which orthotic is right for his type of foot pain. He will also see a podiatrist who can more fully assess his condition.